a new underlying format for the Pointwise project file (.pw) that is up to 100 times faster to read and write. An advancing front (AF) technique may now be used to generate unstructured surface meshes. This method is an alternative to the Delaunay method currently in use and can be applied on a domain-by-domain basis or as the default method for all new domains. The reusable launch vehicle geometry in Figure 1 will be used as geometry for the meshes that follow. 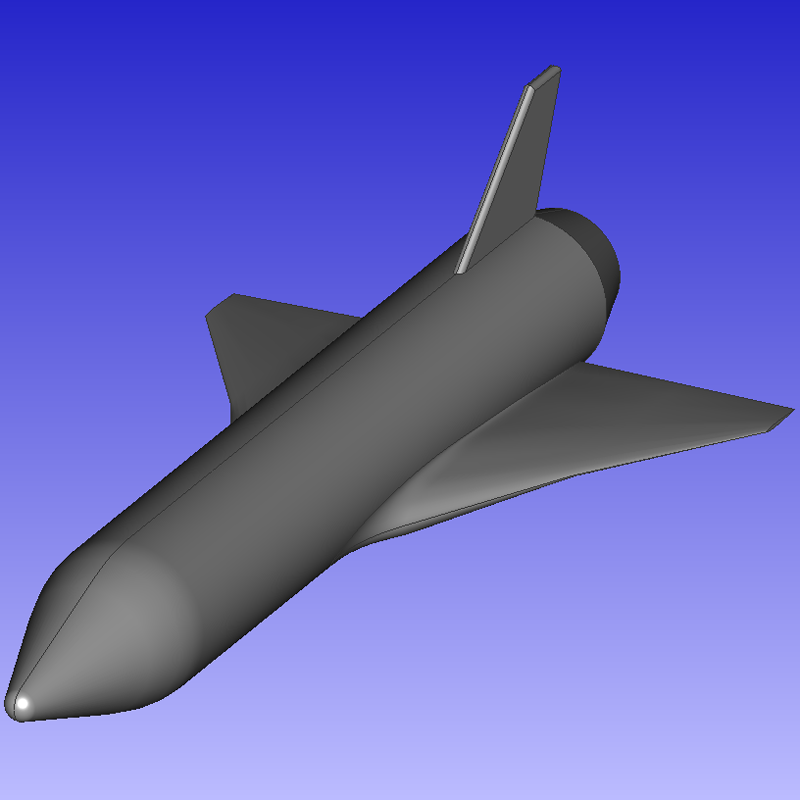 Figure 1: Notional reusable launch vehicle geometry used for comparing unstructured surface meshing algorithms. Let's begin with some background on the Delaunay method. It is a point insertion technique that begins by triangulating the domain using only the boundary points. 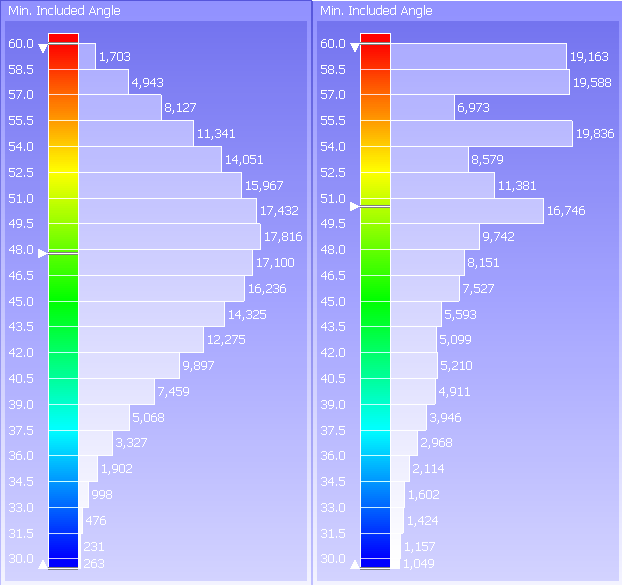 Additional points are then added to the mesh based on various quality criteria of the triangulation. For example, a point might be inserted at the centroid of an existing triangle if the triangle's edges exceed a user-specified length. The algorithm terminates when no triangles need further refinement. The grid on the left side of Figure 2 shows a typical, coarse, isotropic Delaunay mesh. The AF technique works differently. It starts from the boundary discretization (no triangles) and inserts points in a manner such that layers (i.e. fronts) of triangles are advanced from the boundaries to the interior of the mesh. 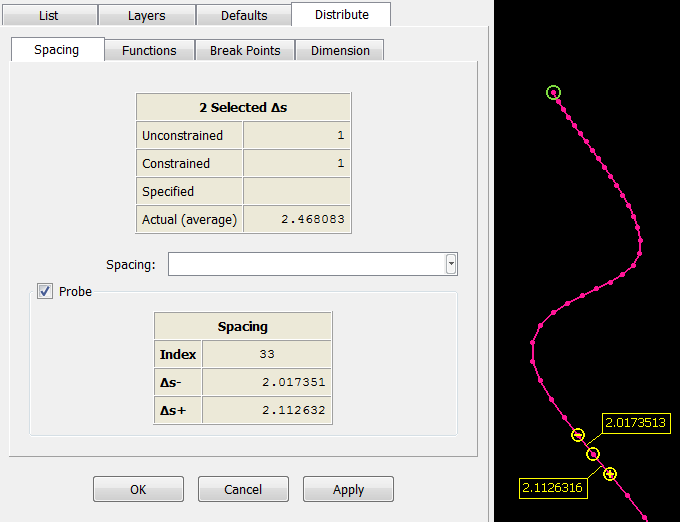 The location of inserted points is based on cell quality, spacing between layers, and other criteria. A coarse, isotropic surface mesh generated using Pointwise's new AF technique is shown on the right side of Figure 2. The “seams” visible in the interior of the mesh indicate where the fronts from the various boundary regions meet. 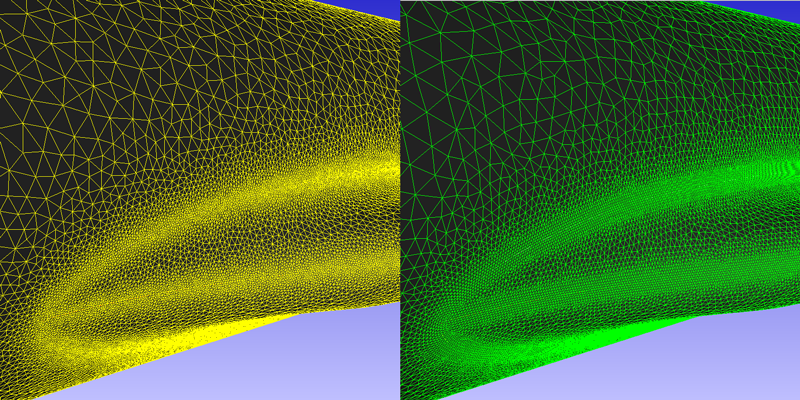 Figure 2: For this coarse mesh, the advancing front algorithm (right) generates a mesh with more regularity in the cells than the Delaunay method (left) for the nose of the RLV. A visual comparison of the two meshes in Figure 2 shows that the AF technique generates a mesh with much more regularity than the Delaunay method. In some instances, this is a desirable property from the standpoint of solver accuracy, not just an aesthetic concern. It is important to note that the AF technique differs from Pointwise's T-Rex method. The latter is designed to generate high aspect ratio cells whereas the AF technique generates isotropic cells. Figure 3: The wing leading edge of the RLV appears to be much better defined and resolved by the advancing front technique (right) than the Delaunay method (left). A mesh with significant cell size variations and clustering, such as the wing leading edge shown in Figure 3, also benefits from the AF technique. 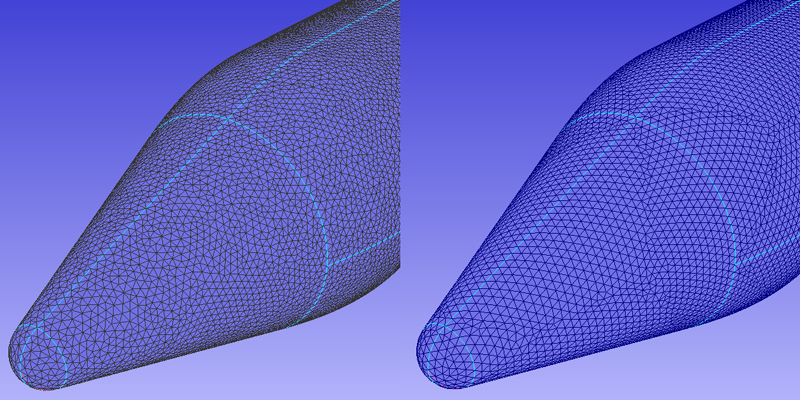 Qualitatively, you can see that the AF technique (Figure 3, right) creates a mesh with a more defined leading edge and wing-fuselage junction than the Delaunay method (Figure 3, left). Figure 4: Comparison of minimum included angle for the Delaunay method (left) and the advancing front technique (right). The advancing front mesh tends to have cells with higher minimum included angles. Our goal (not yet fully achieved) is to “open” the format of the Pointwise project file (.pw) so that users can access their data outside of the Pointwise environment. To help achieve this goal, beginning with Version 16.0 we incorporated the HDF5 (www.hdfgroup.org/HDF5) standard as the basis for the PW file format. Unfortunately, we learned over time that HDF5 suffers from serious performance problems when writing a large number (more than 100,000) of “nodes” to the file. Therefore, in Version 17.1, the PW file format has been changed from HDF5 to a proprietary format that is up to 100 times faster to read and write. Figure 5 compares read times for the new PW file format relative to the old for more than 600 files of varying size and entity count. As you can see, the read time improved by 1 or 2 orders of magnitude improvement depending on the file. 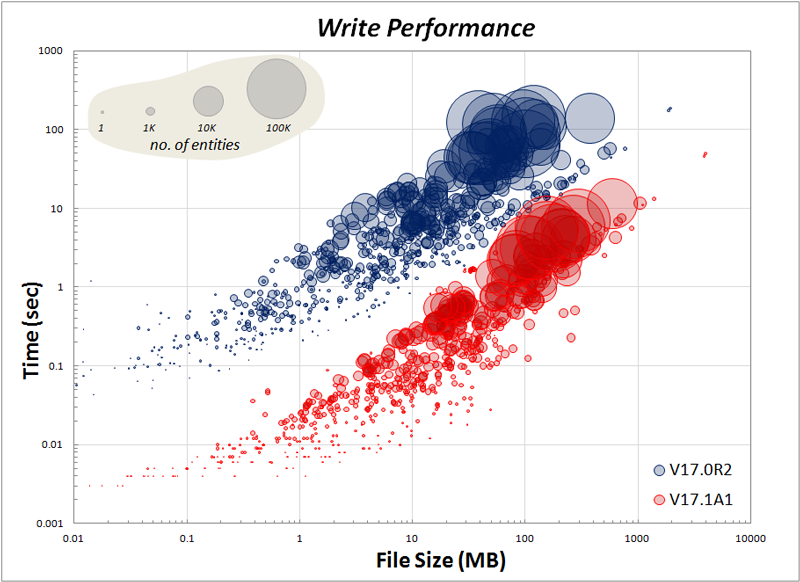 The performance improvement is even more pronounced for writing PW files as shown in Figure 6. 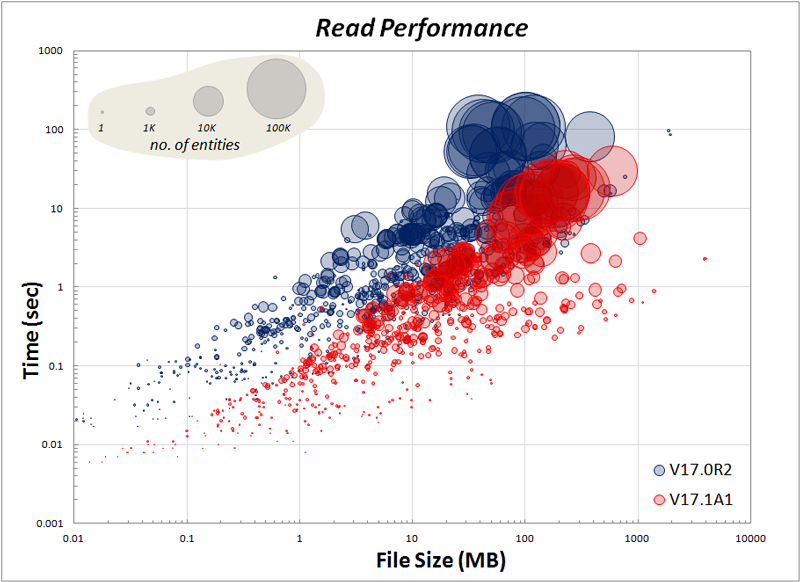 Figure 5: Read performance of the old (blue) and new (red) Pointwise project file formats by file size (horizontal axis) and number of entities (circle size). Figure 6: Write performance of the old (blue) and new (red) Pointwise project file formats by file size (horizontal axis) and number of entities (circle size). The tradeoff for decreasing read/write times is that the PW files will be larger because file compression has been turned off by default. (The older PW format files were always compressed.) If file size is important to you, compression can be enabled via a user preference at the cost of increasing read/write time (see Figure 7). 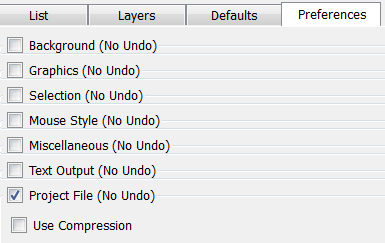 Figure 7: Compression of the PW file can be enabled via the Preferences command. Three new commands give you quite a bit more capability when it comes to creating and editing the topological entities connectors, domains, and blocks. The On Database Entities command for creating connectors has been extended to work directly with Database Boundaries (the minimum and maximum iso-parametric lines of an untrimmed surface, or any of the bounding edges of a trimmed surface). This means you no longer have to manually trace those boundaries or create connectors for a surface and delete the boundaries you don't want. The Edit menu's Add Faces command has been extended to also provide removal of faces from an unstructured block. The command is now called Add/Remove Faces. Now, baffles can easily be removed from a block without having to completely start over. See Figure 8. Similar to the Add/Remove Faces for unstructured blocks, adding and removing edges for unstructured domains has been added to the Edit menu. This makes it much easier to add interior holes or baffles to surface meshes. See Figure 8. Figure 8: New capabilities for topology editing have been added to the Edit menu. When copying a distribution of grid points from one connector to another, the direction of the connectors being copied from now is displayed. This feedback helps decide whether the distribution needs to be reversed or not. The Distribute command now provides the ability to probe the grid spacing values at individual grid points, as shown in Figure 9. Figure 9: The Distribute command's new probing feature displays the spacing on either side of a grid point in both the panel and the display window. Twenty-two new accelerator keys (for example, Ctrl+J to invoke Join) have been added across the product, providing one-touch access to frequently used commands. Here's a brief summary of the new keys. Also, when it comes to image manipulation, Glide (whether or not the grid continues to pan, zoom, or rotate after you stop moving the mouse) can now be toggled on or off as a preference. We rewrote the CAE exporters for CFX, Cobalt, Fluent, SC/Tetra, and STAR-CD to dovetail with the addition to Pointwise's CAE Plugin API (www.pointwise.com/plugins) of new face-based data structures. The updated CAE Plugin API allows you to more easily write CAE export plugins for solvers that use face-based, rather than node-based, data. Global grid and flow attributes (for example, freestream Mach number and units) now can be set and exported for the CAE solvers that support them. This capability is available in both the GUI and the Glyph scripting language. Current customers will have access to all these features via the Downloads page on our website (www.pointwise.com/downloads) as soon as the software is released. 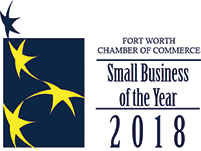 Watch for a special issue of The Connector announcing its availability. Prospective customers who are interested in trying these new features (and more) should request a no-cost evaluation license at info.pointwise.com/pointwise-free-trial.